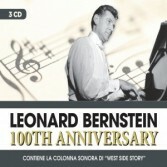 Leonard Bernstein has been one of the most important composers, pianists and conductors. Thanks to his great skills and talents, he was already assistant director of the New York Philharmonic Orchestra at the age of 30, becoming from 1958 to 1969 the orchestra and music director of the same Filarmonica, the first born in the USA to hold these positions. In his career he won 9 Grammy Awards and some other international awards, he has also composed a lot of symphonies and sonatas including "The Symphony No. 1" and "Chichester Psalms" and the musical "On the Town", "Wonderful Town" , "Candide" and his most popular work "West Side Story"